What classes will I have access to as part of my membership? You’ll have access to every class in our library, including special access to some BPC Masterclasses. BPC Masterclasses are offered monthly and can be purchased without a membership. All other classes are not for sale individually. To access your classes, just visit your “My Classes” page! Here you will find classes that you are currently taking, classes saved for later, and classes you have completed. You can find this page by clicking here, or visiting your dashboard and selecting “My Classes” in the left column. How can I access the classes I previously purchased from Big Picture Classes? If you are looking for your classes from our previous site, please visit my.bigpictureclasses.com. Some of your previous classes will be migrated to this new platform in the coming months. Please keep an eye on your email for information regarding that transition. This content will stay live using your old log in and password until July 2015. All students who purchased classes that do transfer over to the new site will receive a unique activation code via the email address associated with your Big Picture Classes account. Once you set up a new account on the site, and follow the instructions in your email, your past classes will appear under your classrooms tab. You do not need to purchase a BPC membership to access your previously purchased classes. Where can I find my digital products? To download your digital product, click the product you wish to download under your My Downloads page. This will open a popup. From this popup click the “Download” button under the product image to begin the download. How much does a monthly membership cost? What are the benefits of having a Big Picture Classes Membership? Unlimited access to content, with new classes added monthly! Learn 24/7 from expert teachers providing the highest-quality content. What you learn is up to you! Go at your own pace. Save some work for later. Take one lesson, or just what you need to get started. Connect globally, with a community of like-minded crafters. Students and teachers collaborate with and motivate each other daily! Full access to private and public groups within our community plus the ability to create your own groups! BPC Masterclasses available for FREE for members. Sign up with the member-exclusive code provided via email or on the class enrollment page to take a Masterclass when it first goes live. All Masterclasses will be added to the general class library 3 months after they are first launched. While we'd hate to see you go, you can cancel your membership anytime without incurring any cancellation fees. To do so, click “cancel” next to your membership details on your account page, under "Orders & Membership". What happens to my class progress if I cancel my membership? It is saved and you can pick up where you left off if you reinstate your membership! What is a BPC Masterclass? A BPC Masterclass is a more in-depth class designed to give students an opportunity to have more comprehensive lessons and have one-on-one time with the class instructor through interactive forums. more compres. These classes are available for FREE to members with a member-exclusive code which will be provided via email once the class goes up for sale. This code will also appear on the class enrollment page for your convenience—simply add it during checkout to enroll in the class for free! Members, sign up during the first month to take the Masterclass when it first goes live to take advantage of live chats and interactive forums. Non-members can also take BPC Masterclasses, available for individual purchase for $20-30. If you sign up for a free trial, you’ll have access any current promo codes to the newest Masterclass. Masterclass content will be available long term, and new BPC Masterclasses come out throughout the year. How do I add a class to “My Classes”? Simply start the first lesson and the class will automatically be added to your “My Classes” page in your account. You'll be able to remove any class that you decide not to take. Think you may be interested in taking it in the future? You will have the option to save it for later, too! Can I save a class so I can find it later? Yes! Look for the “save for later” button and it will be added to a list on your “ My Classes” page so you can find it when you’re ready. How long will a class be available on the site? We don't plan on retiring classes, but if there is a case in which we need to, you will be given at least a 30-day warning so you can complete your class. Do any of the classes include a class kit? Some classes will have a limited number of class kits for preorder or purchase, and others will have a list of suggested supplies you may purchase on your own. Details regarding shipping will be included in the description of the class kit, on the classroom page, or will be displayed at checkout. How do I report a comment in my class? If you find an inappropriate comment please report it immediately by starting a conversation with our Customer Experience department or by clicking on the “report” link under the comment. Will I have the ability to download videos or class content from my classroom? No. Some classes may have free printables or digital items to download, but PDFs will not be provided with class content. How do I upload a project to the gallery? All project uploads are done via the class lesson pages – we’d love to have you share what you’re doing in class to help inspire your fellow students! Just look for the “Upload Your Project” button on the lesson page. Do I need a membership in order to enjoy my previously purchased classes from the original BPC site? Nope! Once you receive your unique activation code within the next couple of weeks, your classes will be stored on your account and you can access them at any time, whether you have a membership or not! How often are new classes released for BPC members? 10-15 (or more!) classes will be added to our library each month! What previous classes will be transferring to the new site? While you’re a member, you’ll have access to every class in our library, including special access to some BPC Masterclasses. We’ll be working with expert teachers, crafters, and makers to add 10-15 (or more!) classes to our library each month, and we’ll give you 30 days’ notice should we need to retire a class. Instead of one large message board, you have the ability to join groups, based on the topic you are interested in! We have created five groups that anyone can join (even if you don't have a membership! ), and those of you who have a membership will be able to create other groups based on different topics and discussions. Members may join as many groups as you'd like! Are you worried about sharing too much information publicly? Members will have the option to create or join both public or private groups. I don't have a membership. Can I still participate in the community groups? Anyone can participate in the five groups created by our staff here at Big Picture Classes! All other groups created by members, are for members only. Digital products are another exciting tool we want to provide for you here. These products are downloaded elements such as printables and cut files that add an extra layer of creativity to your paper projects. Paper crafting projects that utilize digital products are known as hybrid projects. What is digital cardstock and how do I use it? Digital cardstock papers make dynamic bases for digital layouts and enhance hybrid projects. They are fun paired with the digital layout templates or print your own perfectly coordinated papers. Not quite sure what a digital layout is? You can see some examples if you search “digital layout” on our site! What are digital stamp brushes and how do I use them? Digital Stamp Brushes are a great tool to really stretch your kit. Add digital brushes to your project or directly to a photo in an editing program. To use these you will need a photo editing software (like Photoshop, Photoshop Elements, Corel Paint), your digital photo, cardstock or photo paper, and a printer for your final project. What are digital layout templates and how do I use them? Digital layout templates are an accessory to enhance your layout into a piece of art in a matter of moments using clipping masks in Photoshop or any other photo editing software. Once you have your template complete you can print out your project and bring it to life with your supplies. To use this you will need a photo editing software (like Photoshop, Photoshop Elements, Corel Paint), your digital photo, cardstock or photo paper and a printer to print our your final project. For added fun you could always add digital paper, journal cards, and text to your template. 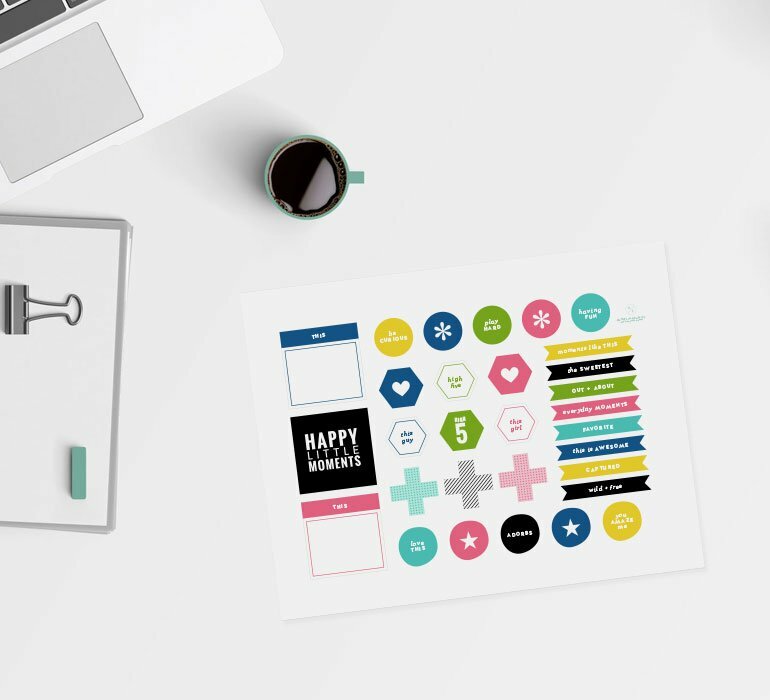 Printable Journal Cards & Shapes are one of our easiest digital elements to use! Literally, print and cut out beautiful designed pieces and have them ready to go. To use this you will simply need cardstock, scissors, and a printer. What are cut files and how do I use them? Cut Files are shapes or word-art electronic files that you can use on your die cut machine, and they are sure to keep you inspired. You will need a digital diecut machine (such as a Silhouette Cameo or Cricut Explore), a cutting mat, blade and cardstock or patterned paper. Your credit/debit card will be billed on the day in which you sign up for a membership and the same day each month thereafter. Any membership started between the 29th and 31st will be first billed on that day, but will be billed on the 1st in subsequent months. If you started your membership with a free trial, your card on file will be charged upon the completion of your free trial and the same day each month thereafter. i.e: If your free trial ends and your membership starts on March 5th, your card will be charged on the 5th of every month. Any free trail that ends between the 29th and 31st will be first billed on that day, but will be billed on the 1st in subsequent months. I want to cancel my membership. Will I still have access to all my groups? While your membership is canceled, you will not be able to participate in your current community groups. No need to fret - we will save all of your information, so you can access your groups again if you restart your membership! Don't worry about those groups that you started - they will still be available to the followers of your group. However, you won't be able to participate in this group unless you have an active membership. How do I gift a class or a membership? We do not currently have a gift option at this time. Check back for future updates! Please read all terms thoroughly before agreeing to purchase via the Preorder system. Once added to the Preorder list for a shop purchase, you have agreed to purchase that particular item. Any cancellation of a Preordered purchase will be subject to a $15 cancellation fee, unless a different amount is stipulated in the terms of the agreement. Where can I view my order after it is placed? Once your checkout is complete, you will receive a confirmation email with all of your order details. Don't forget to check your junk or spam folder if you don't receive that order confirmation email! You can also view all order history by visiting your "Orders & Membership" tab on your "My Account" page. Charges on your credit card statement will appear as "INKED DBA BIG PICTURE CLASSES". Inked Brands Inc is the merchant of record on all transactions completed on www.bigpictureclasses.com. Customers who live in the following states will have sales tax listed at checkout as a separate line item: CA, CO, CT, GA, HI, IL, IN, IA, KY, LA, MD, ME, MI, MN, MO, NC, ND, NE, NJ, NV, OK, PA, RI, SD, UT, WA, WI, WV, and WY. These taxes are imposed by the state on the purchase of goods and services and are not limited to Big Picture Classes. The applicable rate is set by each state respectively. How do BPC gift cards work? Gift cards may be purchased and gifted for use toward shop products only. Unfortunately, gift cards may not be used for monthly membership. Your order will ship within 24 business hours! All digital items purchased will be available immediately under your Downloads folder on your account. Shipping rates for items from the shop will vary by service type, weight/size of order, and dollar amount of order. Refer to the Checkout page for accurate shipping and handling amounts. Free shipping for all domestic orders of $79 and Canadian orders of $99. Free shipping applies to Economy shipping only. This excludes digital items, classes, and items with fixed shipping. What if my shop item arrives damaged? We pride ourselves on packing each order with care, however we don't have much control of a package once it leaves our warehouse. If you receive an item that is damaged, our Customer Experience Team will take care of you. Please start a conversation here. Oh no! We certainly wouldn't do this on purpose, but we are human and make mistakes from time to time. If something is missing from your order, our Customer Experience Team will take care of you. Please start a conversation here.